Vitamin D deficiency is highly prevalent among children worldwide. It includes impaired immune response to infection and decreased activity of gut antimicrobial peptides. Elucidating the impact of vitamin D deficiency for the severity of acute diarrhea among children may be helpful for the disease management. Determination of vitamin D status in toddlers with acute diarrhea and evaluation the relationship with diarrhea severity. 77 children (1.0 – 3.5 years) with acute diarrhea, hospitalized in the Department of Infectious diseases were enrolled in the study. The patients were divided into 2 groups: with risk factors for severe diarrhea (group A, n = 30) and group B without risk factors (n = 47). 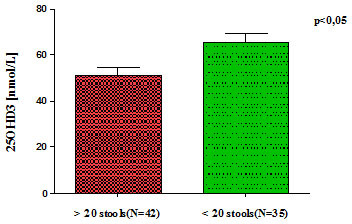 The severity of diarrhea was assessed by the number of stools. The levels of circulating vitamin D were assayed by liquid chromatography with tandem mas-spectrometric detection. One way ANOVA and Kruskal Wallis statistics were used for statistical analysis. Patients in group A were vitamin D insufficient (median 53,63 nmol/L), compared to group B (median 66,09 nmol/L), p<0.05. Vitamin D deficiency (median 49,20 nmol/L) was detected in children with severe diarrhea (>20 stools) vs vitamin D in children (median 64,93 nmol/L) with less intensive diarrhea, p<0,05. An inverse relationship between vitamin D levels and diarrhea intensity and outcome was detected. For both groups considerable seasonal variations in vitamin D levels were established. Vitamin D deficiency may impact on the severity of acute diarrhea in children. Vitamin D supplementation could be favorable for prevention of acute diarrhea in vitamin D deficient toddlers. A pandemic of vitamin D deficiency is rising simultaneously with the expansion of a novel concept about pleiotropic effects of calcitriol [1,2]. One of the results of its immunomodulating effects is the production of antimicrobial peptides, including in the intestinal mucosa [3-5]. On the other hand, acute diarrhea is a major part of the infectious pathology in Bulgaria, especially among infants. The latter facts make reasonable the estimation of vitamin D status of young children with acute diarrhea. Determination of vitamin D status in toddlers with acute diarrhea and evaluation the relationship with diarrhea severity. We determined the levels of circulating 25-hydroxyvitamin D3 in 77 children aged 12 to 42 months with acute diarrhea, admitted in the Department of Infectious diseases in Varna, Bulgaria, using liquid chromatography with tandem mas-spectrometric detection. At admission all patients were also measured height, weight, questionnaires about feeding practices were filled in, laboratory investigations were performed. Data about previous diarrheal episodes was searched for in the medical documentation. 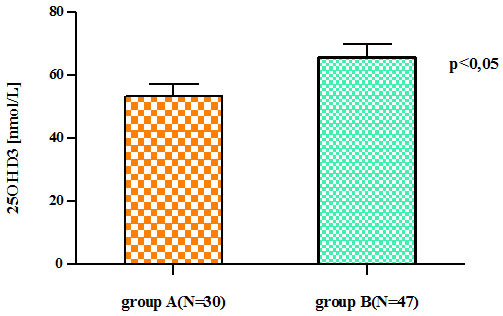 According to the presence or absence of some unfavourable conditions (low height and weight for age, anemia, previous diarrheal episodes and data of inappropriate feeding practices), the patients were divided into 2 groups: with risk factors for severe diarrhea (group A, n = 30) and group B without risk factors (n = 47). The severity of the disease was assessed by the number of diarrheal stools – above 20 for the whole episode was considered severe. Statistical analysis was made using one way ANOVA and Kruskal Wallis statistics. We found that 49 of the 77 patients enrolled in the study had 25OH VitD3 concentrations less than 75 nmol/L, corresponding to suboptimal vitamin D status. Serum 25OH Vit D3 in 9 of them was measured under 25 nmol/L (corresponding to severe deficiency), in 16 was between 25 and 50 nmol/L (mild deficiency) and in the rest 24 patients was found in the range 50-75 nmol/L (insufficiency). 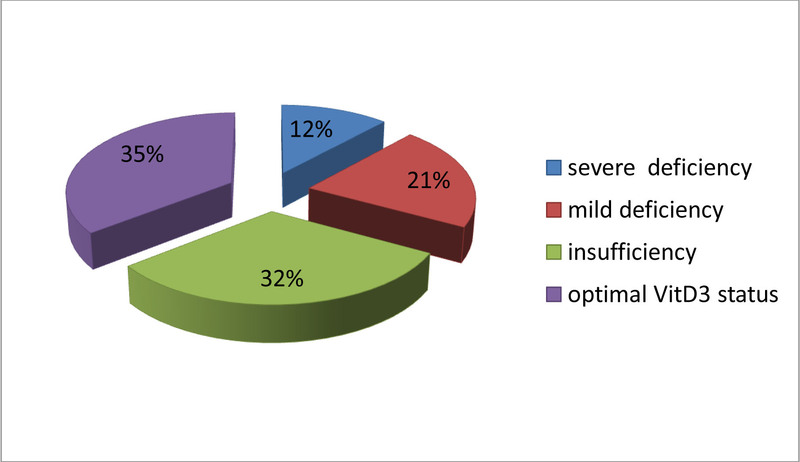 These results are presented in percentages in Figure 1. The mean serum 25OH-VitD3 concentration of the group A patients (with risk factors for severe diarrhea) was 53,63 nmol/L. It was 12,46 nmol/L lower (p< 0,05), compared to group B patients (without such risk factors) with mean serum level of 66,09 nmol/L (Figure 2). Both groups were estimated as insufficient with regard to their vitamin D status [6,7]. Strong seasonal dependency was demonstrated in both groups as could be seen in Table 1. The difference in mean Vit D3 concentrations between warm and cold months is significant for group B patients (24,42 nmol/L, p<0,05). Mean serum 25OH-VitD3 for the patients of both groups in cold season is estimated as deficiency for being between 25 and 50 nmol/L. Regarding the intensity of the disease, the patients were divided in two groups – children with less (N = 35) or more than 20 stools (N = 42) for the current diarrheal episode. We found significantly lower median level of 25OH-VitD3 (49,20 nmol/L) in the group of patients with more intensive diarrhea (corresponding to deficiency), compared to those with disease of less severity (64,93 nmol/L), Р<0,05 (Figure 3). Dependency was found between diarrhea intensity, the presence of unfavourable conditions and the amounts of circulating vitD3. This small research shows that Bulgarian toddlers are not spared by the pandemic of hypovitaminosis D, irrespective of the fact that the climate in our country provides at least five sunny months a year. It correlates with the modern conception about the immunomodulating effect of vitamin D3, including in the intestinal tract. It grounds the need of further investigations in relation to future applications of this vitamin in the setting of acute diarrhea. ©2014 Mileva S. This is an open-access article distributed under the terms of the Creative Commons Attribution License, which permits unrestricted use, distribution, and reproduction in any medium, provided the original author and source are credited.